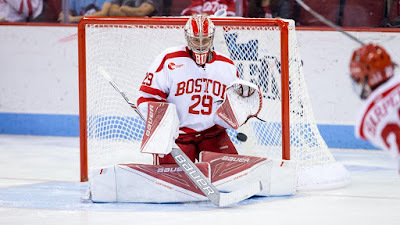 Co-captain Dante Fabbro, assistant captain Jake Oettinger and freshman Joel Farabee were named to the Hockey East Top Performers list for the past week. Fabbro scored twice, including the game-winner in BU’s 4-1 win against Northeastern. Oettinger posted a .941 save percentage and 1.98 goals against average in two games against the Huskies. Farabee contributed a goal and an assist in the series that saw BU take three of four points. ►The Terrier Takeaway from Saturday's win is from blog contributor and New York Times writer Neal Boudette, who spoke with Coach O'Connell after the game. -Overall, a very convincing and complete win against a good Northeastern team. -Need to improve: penalties and breakout. BU 29 mins in the box, NU just 12. That meant NU had 14 mins of PP time, BU only 5. -Breakout struggled at times in 1st and 2nd, allowing NU to keep puck in Terrier zone and put sustained pressure on Oettinger. -First period play was even. NU had the edge in SOG but Terriers went to the locker room with a 1-0 lead, thanks to Fabbro (more on that guy in a minute). New York Hockey Journal profiles 2019 recruit Case McCarthy, who says he models his game on Charlie McAvoy's. The 6’1” right-shot defenseman from Clarence, NY began his season playing in the All-American Prospects Game in St. Paul. He has four points (1G,3A) in his last three games for the NTDP U18s, who begin the Five Nations Tournament in the Czech Republic on Wednesday against Sweden. 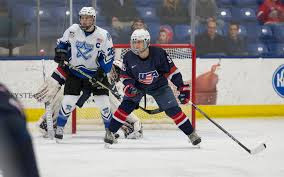 2020 recruits Luke Tuch and Dylan Peterson each scored a goal for Team USA in a 5-1 win against the Czech Republic in a preliminary round game at the World U17 Challenge in St. John, N.B. Tuch, who is second in scoring on the NTDP U17s, tallied the game-winner three minutes into the second period on a short-handed effort after Peterson had opened the scoring in the first period. A third 2020 recruit, goalie Drew Commesso, stopped 14 of 15 shots to earn the win. Team USA is back on the ice tonight to face Canada White at 6:30 p.m. Preliminary round games are being live-streamed by Hockey Canada.